Howdy is an intelligent networking app that employs artificial intelligence to generate recommendations for people at events to meet other people. If it sounds too simple—well, because it is. Even if one is a seasoned schmoozer, one still has to go through trial and error before landing the right connection. But if there is a guide that steers you through a sea of strangers, you will make valuable connections. That guide is presumably Howdy. Howdy is a high growth technology business that was founded by Ben and Tristan Abbott and Will Wynne in London. Ben and Tristan are brothers, and Will is their sister’s boyfriend. In March this year, Ben, who is Howdy’s CEO, moved with his wife and two young children to Singapore to set up operations and grow the business globally. Ben’s family has a history with Singapore. His grandfather was posted here as a 21-year-old officer in WWII, and imprisoned by the Japanese after the Fall of Singapore. His father had Singaporean business partners. His wife’s grandfather was posted to Singapore as Major General senior medical officer in 1960s, and her sister has lived in Singapore for 10 years. Ben is passionate about building businesses that can be a force for good; he advises a family office investment business and is an advocate for mental health awareness as his father took his own life 20 years ago. He has been capturing some of his family’s new Singapore life on instagram at @benabbottinsta. The initial inspiration for Howdy came to Ben and his brother Tristan while they were sitting around in coffee shops in London, the de facto offices for entrepreneurs before formal co-working spaces had taken off. “We would look around thinking who was everyone,” Ben remembers. “We wished a spotlight could be shone on the right people to talk to. We started to think how connected everyone is on social media, and how cool it would be if we could develop some technology that bridged the digital world to the real world by identifying the right people to meet.” Dating apps were doing it, he reasons, but what about connecting the right people in an easy way for collaboration opportunities, to solve a problem, or find a job? Initially, Howdy was about simply making the connections at events, but now as it covers communities it will be implementing increasingly useful features that make Howdy helpful everyday. “On a practical level Howdy is an app as a platform,” Ben emphasizes. “Meaning that best-in-class third-party technology can plug in the back. We don’t want to build everything; for example, we want to be able to provide Q&A functionality to our customers via the Howdy app, but we are happy to have that service come from a company whose sole focus is on building world class Q&A tech. Facebook and LinkedIn are astonishingly good at maintaining connections, Ben says, but not in helping make people make new, meaningful connections. 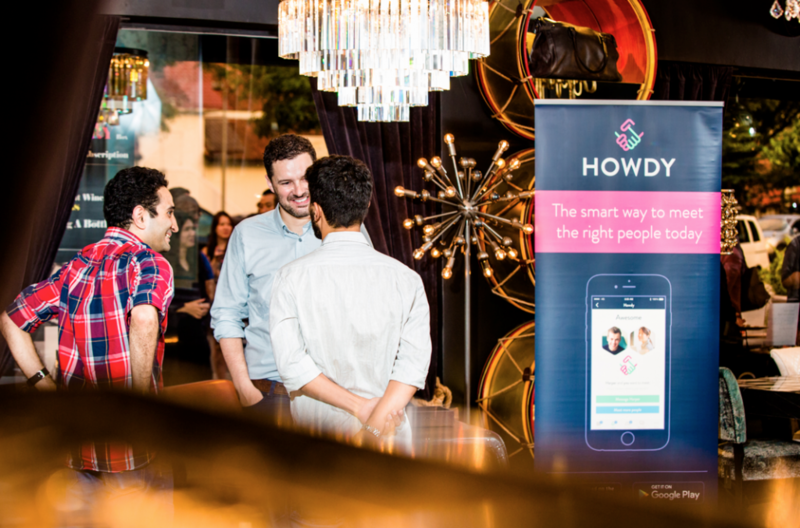 This is what Howdy does, and because the new connections are based on events and community, it means people who discover each other on Howdy actually go on to shake hands and grab a cup of coffee. “Howdy’s events and communities are also closed so your profile is not open to the world; it only appears where you want it to,” Ben notes. It is also different from other social media because consumers only see content that is contextual to their passions and work, not their entire network’s interests, and in that way it is more personal and therefore relevant. Howdy is a private company incorporated in Singapore and the UK, owned by its team and investors. “We believe all of our long-term employees should participate in the success of Howdy and so they all own some equity in the business,” Ben notes. “We have received investment from successful Singaporean and European entrepreneurs who add so much more to Howdy than just the capital,” Ben says. “They have been through the experience of growing both technology and traditional businesses globally so they double up as fabulous advisors. Howdy follows a ‘freemium’ business model, meaning it is to consumers. Anyone can host an event or community on Howdy for free, but if the host wants certain premium functionality, say, to publish sponsor collateral and/or to receive data insights, then he needs to pay. “We are expanding our viewfinder to other sectors, such as hospitality and travel.” Howdy is currently hiring staff in preparation for the opening of its office in Kuala Lumpur in October. Plans are underway to set up offices in Hong Kong and in the US at the beginning of next year. This article was originally published in Portfolio Magazine.